The Swaminarayan Temple in Louisville, Kentucky is vandalized in a hate-motivated act targeting the Hindu community. Louisville police arrest 17-year-old white male for criminal mischief and burglary at the Swaminarayan temple. A vile act of vandalism at a Hindu temple in Louisville, Kentucky, has caused anguish and outrage in the Indian American community. 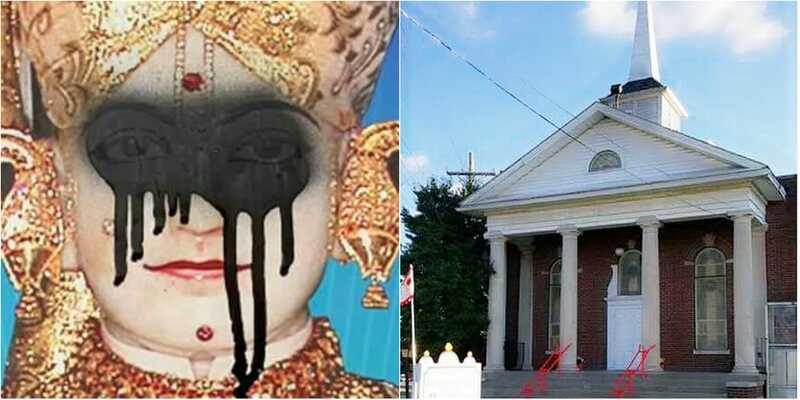 Sometime between Sunday night and Tuesday morning, the Swaminarayan temple on Bardstown Road in Louisville was desecrated with repugnant messages of hate and black paint sprayed on the image of a deity – such a shocking act of sacrilege! Reportedly, a knife was plunged into a chair in the main hall of the temple, and the vandal covered the walls with black crosses and phrases such as ‘Jesus Is The Only Lord’ and ‘Jesus Is All Mighty’. Addressing a news conference Wednesday, Louisville Mayor Greg Fischer condemned the xenophobic actions as “cowardly and unacceptable” and vowed, “Anytime we see hatred or bigotry, we will stand against it. The cowards who did this have only given our community more fuel and determination to embrace compassion, understanding, and each other,” he said after surveying the damage at the temple. Hinting at the increase in hate crimes under the Trump administration, Krishnamoorthi stressed the importance of supporting the Swaminarayan Temple “even as we recognize this prejudice as part of a growing trend of hate-motivated crimes in America whether it’s against a Hindu temple in Louisville, a synagogue in Los Angeles, or a man walking alone in the morning on the streets of Chicago,” he said. Kentucky Gov. Matt Bevin conveyed Thursday on Twitter that he is “saddened by the reprehensible and inexcusable vandalism” at the Hindu temple in Louisville. In a state and nation that protects and celebrates religious liberty, this is unacceptable, he said. Mayor Fischer invited the community at large to the temple on Saturday “to help clean up and paint away the hate. Please bring your own supplies and your compassion. As Louisville always does, we’ll work together to proudly send a message to the people who did this, and to everyone in our city and beyond,” he said. State representative Nima Kulkarni, the first ever Indian-American elected to the Kentucky General Assembly, said she was honored to stand in solidarity with members of the Swaminarayan Temple, alongside Mayor Fischer, state representative Joni Jenkins, and Police Chief Steve Conrad, at the news conference, to denounce the hateful vandalism that occurred there. “We must take this opportunity to renew faith in our community and rise above these hurtful acts,” she said in social media posts urging local residents to join in the cleanup efforts on Saturday. “Let’s erase the hate together,” she implored.